Happy Friday! This weekend is going to be packed full of fun things. I’ll be volunteering as a judge at Fittest in OK, a local CrossFit competition hosted by my gym, CrossFit 405. The competition will be held at Cox Convention Center January 24 and 25, and will feature some great athletes from around Oklahoma. If you live in or around the area, come by and check it out! I love volunteering as a judge for local competitions in Oklahoma. It’s great watching people from all types of athletic backgrounds (from people just starting out, to semi-seasoned pros) lay it out all on the floor once the clock counts down; 3……2……1… go! I’ve participated in several team competitions over the years (but have not competed as an individual….yet!). I’ll be volunteering both Saturday and Sunday, which will take up a majority of my weekend. Thankfully, I was able to meal prep last weekend, and made several things that will help me be ready for next week since I won’t have much time to spend in the kitchen this weekend. I’m a big fan of prepping food during the weekend. Knowing that I spent a couple of hours during the weekend cooking up proteins and chopping veggies to create quick and delicious meals helps take the stress off of worrying about what I’m going to eat when I get home from work during the weekday. 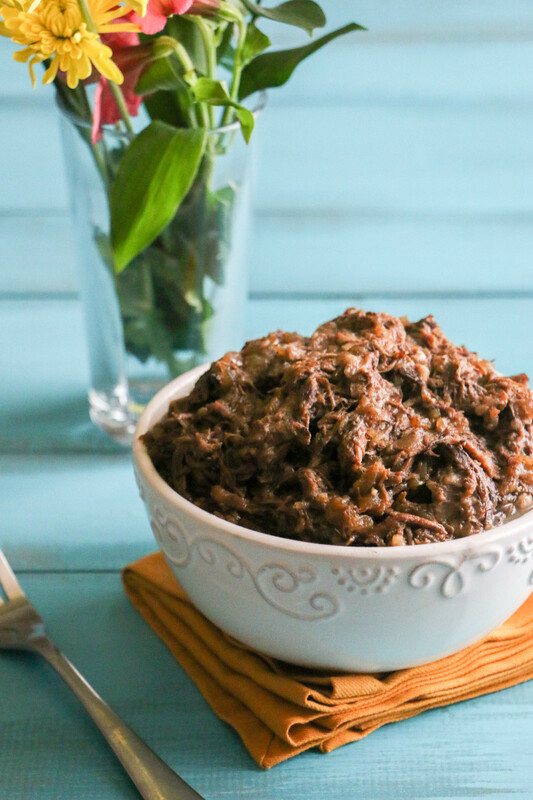 This recipe for Slow Cooker Honey Balsamic Pot Roast is a great addition to any meal prep. The combination of sweetness from the honey and the tangy kick from the coconut aminos help the flavors in sauce come alive! 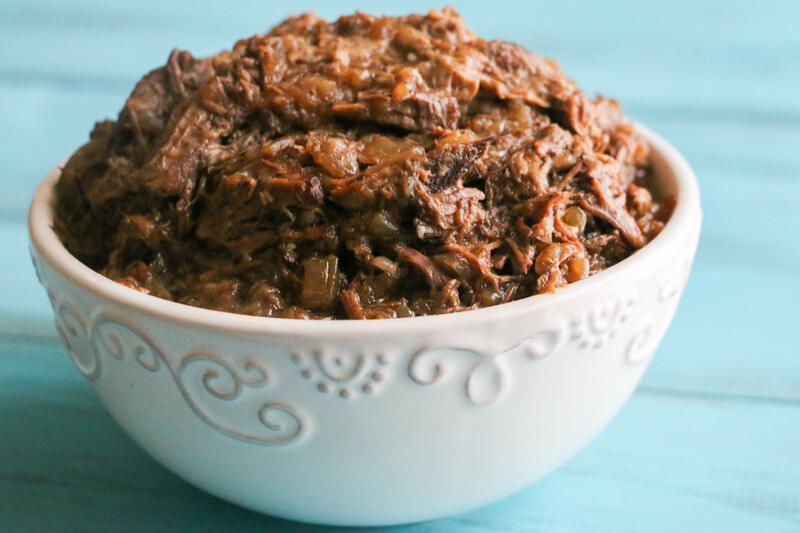 In addition, slow cooking the pot roast over low heat allows the sauce to tenderize the meat, and the result leaves you with fork tender bites of pot roast. I originally made this recipe as part of Christmas dinner last year when I was in Houston for the holidays. Since then, I’ve made it several times over the past month. This recipe would be great paired with my Roasted Sweet Potatoes and Brussels Sprouts. It also goes well with mashed sweet potato, and I’ve got a new recipe for mashed sweet potatoes that I’ll be sharing with you next week. Until then, please enjoy this recipe for Slow Cooker Honey Balsamic Pot Roast. If you try this recipe, please let me know what you think. I love reading your comments! Heat cooking fat over medium high heat in a large skillet. While the fat is heating, liberally season both sides of the chuck roast with salt and pepper. Add the chuck roast to the preheated skillet, and sear on one side for approximately 7-8 minutes until browned. Then flip over and sear the other side of the chuck roast for 7-8 minutes. While the meat is cooking on the stove, in a medium sized bowl, mix together the beef broth, balsamic vinegar, honey, coconut aminos, thyme, rosemary and minced garlic. Remove the skillet from the heat, and set the chuck roast aside on a large plate. Remove all but one tablespoon of cooking fat from the skillet, and then place the skillet back on the stove (with the 1 tablespoon of cooking fat). Add the onions to the skillet, and sautée over medium heat until the onions turn golden brown, 8-10 minutes. Remove the onions from the heat, and place into the bottom of the slow cooker insert. 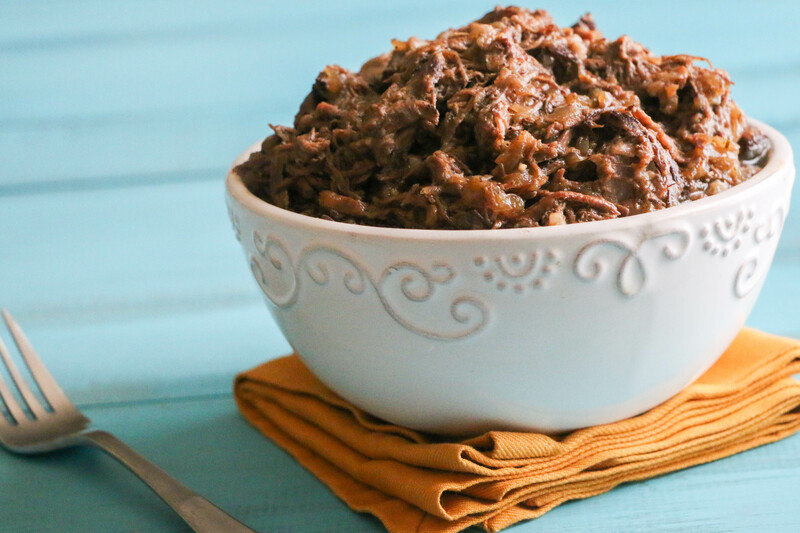 Place the chuck roast on top of the onions, and then pour the sauce mixture over the chuck roast. Cover the meat, and cook on low for 8-10 hours, or on high for 4-5 hours. Once the meat has done cooking, you can shred the meat with a fork, plate and serve! Be sure to use the liquid from the slower cooker as gravy/sauce for the pot roast. Recipe inspired by Add a Pinch. Tags: best pot roast recipe, chuck roast, crockpot recipes, diary-free, Gluten-Free, grain-free, paleo, pot roast, Primal, slow cooker recipes | Permalink. We really enjoyed the roast. This will be my go to recipe. I was a bit concerned the vinegar and garlic amounts would be over powering, but the flavors melded together where one did not stand out more than the other. And the carmelized onions gave it that over the top yum. Great recipe. I’m very glad you liked it Kim. I agree with you that the onions take it to the next level! Terrific roast! I was afraid the vinegar and garlic might be too much, but the flavors melded well. The carmelized onions gave it such a comfort food feel. This will definitely be served again and again.